The novel chronicles a family's struggle and the history of their fictional town, Macondo. 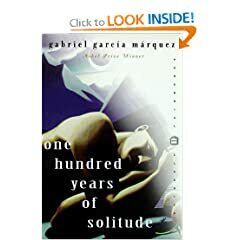 Although the title implies that the story spans one hundred years, it is unclear exactly how much time the narrative covers. This ambiguity contributes to the novel's treatment of time, as there is a notion that time lapses, repeats, changes speeds, or stops altogether at different parts of the story, and that all the events in some sense happen simultaneously.